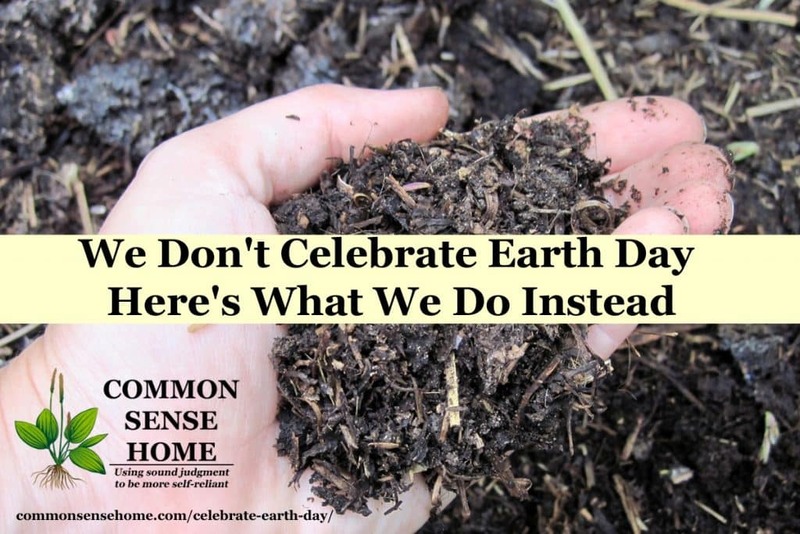 My family doesn't celebrate Earth Day, but we do our best to be good stewards every day. Small changes add up over time. I want to empower you to improve your health, and concentrate on those things you can impact directly – your family, friends, neighbors and community. Here are simple simple steps you can use all year round. There are thousands of edible plants, but most of us eat only a few. You can gather free food that's high in vitamins, minerals and omega-3 fatty acids from your lawn and garden. The Weekly Weeder series introduces over 40 different common wild plants, many of which are edible and/or medicinal. Wild plants are often more nutrient dense than their domesticated cousins, which is great for promoting health and wellness. Spring is the best time to gather many of these plants, when the greens are young and tender. Many of these are known carcinogens, but are allowed since they are not ingested or are used in small quantities. The thing is, when you put them on your skin every day, it all adds up over time. Your skin is porous – things move in and out – otherwise transdermal medications wouldn't work. Check out “No More Dirty Looks” for more info. One afternoon of measuring and mixing can keep you in skincare products for months, and these make great gifts for birthdays and holidays, such as Mother's Day. The more you can grow yourself or purchase locally, the fewer “food miles” you rack up. Right now, the average American meal travels around 1500 miles to get to your plate. That's a lot of fuel. Most food grown by large growers is mechanically planted, tended and harvested. This reduces labor cost, but burns a lot of fuel. It's more environmentally friendly to wander from your garden to your kitchen. Many commercial foods also contain ingredients I'd rather not eat, like anti-foaming agents, artificial colors and flavors, genetically modified crops, foam rubber yoga mats – just kidding! The chemical azodicarbonamide, an industrial “chemical foaming agent,” is found both in yoga mats and over 500 processed foods, but the foods don't contain actual yoga mats. Still not yummy. Contrast this with Cheese Soup in Homemade Bread Bowls, where the bread is made with just five ingredients and not a yoga mat in sight. Or how about some easy chocolate brownies – no box required, and simple enough for the kids to make. Food doesn't have to be fancy to be delicious. There's an old saying that says, “The best time to plant a tree is 30 years ago, and the second best time is today.” Gardening is a wonderful way to reduce stress, heal your mind and improve your diet. It's very forgiving, too. If you screw up, there's always next year. Even if you only plant one tomato in a pot on the patio, you're reducing those food miles a smidgen and bringing more plant matter into the world. More plants equal less rainwater runoff, and plants moderate temperature swings by providing shade from intense heat and creating wind breaks – on a big scale for trees and a small scale for other plants. If you look deeper, herbalists like Stephen Harrod Buhner refer to plants as “the planet's natural healers, stabilizers, and chemists“. Every living plant creates its own complex micro-ecosystem composed of millions of micro-organisms on its surface and in the ground surrounding it. It's crazy complicated and crazy beautiful, and I could go on about it for ages, but the most important thing to remember is healthy soil = healthy plants = healthy people. We've been slowly swapping the lights in our home for LED replacements, and I encourage you to do the same. 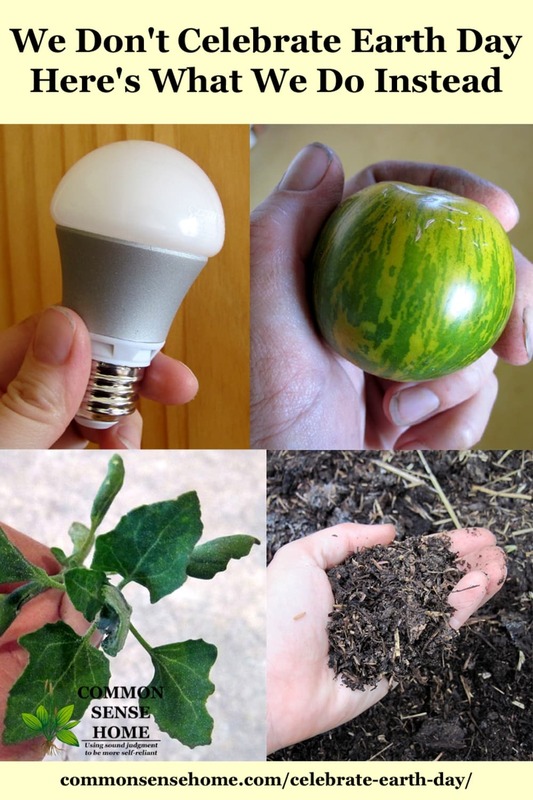 LED lights use only a fraction of the amount of energy of incandescent lights. In summer, incandescent lighting also adds to your air conditioning load, so you're hit with a double whammy. Swap out now and save all summer. One other note – if you just happen to have teenagers who stay up way too late reading, LED lights in their clip on bed lamps won't get hot like other lights. This reduces the risk of fires and burns. They also make great LED nightlights, for those of us who have to stumble around the house in the middle of the night with critters or kids. When we start making choices that are healthier for us, most of them are also better for the environment. Did you know that the majority of the corn grown in the United States is legally classified as a pesticide, not a food? That's because the bug killing genetic component is spread throughout the entire plant – it's all toxic. Conventional crops are heavy on the chemicals such as herbicides, pesticides and fertilizers, but lower in nutrition and harder on the environment. In “Common Sense Health: Detox, Diet and Physical Activities“, I talk about removing toxins from your home, your personal care routine, and your diet. If enough of us vote with our dollars for cleaner food and products, producers will listen. You can learn more about Common Sense Health in the video below. What choices do you make every day to live more mindfully? Leave a comment below to share your thoughts. Originally published in 2014, updated in 2017.
i’ve shared the link twice and the discount did not apply. i would still like to get the bundle at 9.95 but i likely won’t be able to get back online before the sale expires. So it sounds like you click on the link you shared to your facebook page to access the discounted price? You’re the first one to try this from my site, so I hope this works. If it doesn’t, message me at laurie @ commonsensehome.com (no spaces, those are just for spambots), and I’ll make sure you are issued a refund for the difference.